The benefit of an improved health facility and system: Suriyana’s baby boy was successfully resuscitated by a midwife trained through the EMAS program. Labuhanbatu, Indonesia—A crying baby is often a cause for concern rather than for celebration. But for 18-year-old Suriyana, hearing her baby cry was a treasured moment of celebration. In April 2014, Suriyana, just 36 weeks pregnant, went into preterm labor. The road ahead was bumpy—literally: Suriyana’s rural village was an hour away from her health facility. She climbed onto the back of a motorcycle and rode for an hour to get care at Labuhan Bilik health center in Labuhanbatu, North Sumatra. Upon arrival, Salwani, a midwife at the health center, quickly discovered that Suriyana was leaking discolored fluid, indicating that her baby may be in distress. And indeed, when Suriyana gave birth three hours later, her baby boy was not breathing. Thanks to training through EMAS, midwife Salwani took the appropriate actions to ensure Suriyana’s newborn baby would survive. Salwani knew that the first moments after birth were critical. She immediately initiated a series of actions designed to help Suriyana’s baby to breathe. “We stimulated him and suctioned his mouth and throat,” the midwife explained. “As the baby’s skin color began to pale, we began ventilation. We used a bag and mask to give the baby two breaths, but the baby’s chest did not rise and he did not cry either,” she added. For Suriyana, who was nearby, the wait must have been interminable as Salwani worked on her newborn son. Birth asphyxia—not breathing at birth—is the second leading cause of newborn mortality in Indonesia (22%1) and worldwide. Without lifesaving care in the first few minutes of life, babies can die or suffer long-term complications as a result of delayed breathing. With the right skills, midwives can manage birth asphyxia effectively, but in Indonesia, few trained care providers keep their skills updated, and many midwives—particularly those serving rural communities like Suriyana’s—are unprepared to deal with complications. 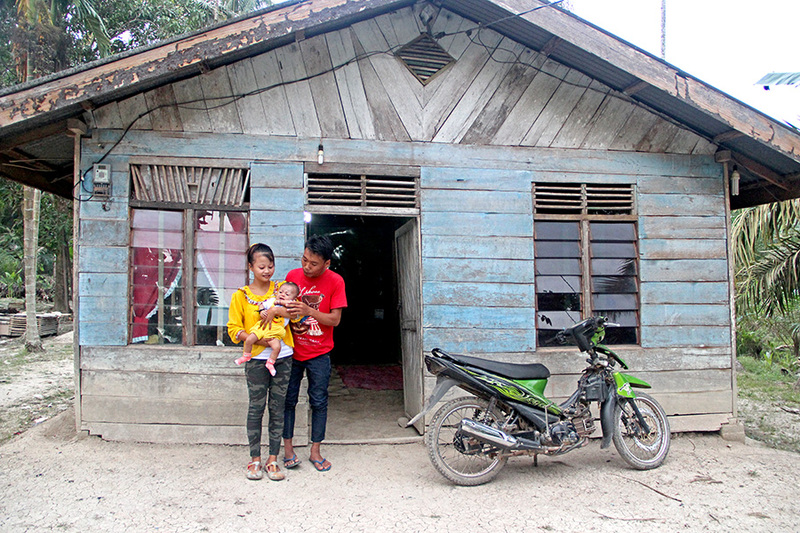 While Suriyana was determined to make it to the health center when she went into labor, many Indonesian women choose to deliver at home, where a skilled birth attendant may not know how to manage an emergency like birth asphyxia. Suriyana and her son are alive today not just because of a single intervention, but because the U.S. Agency for International Development’s Expanding Maternal and Neonatal Survival (EMAS) program is addressing the entire system of maternal and newborn care—whether advocating for facility birth, encouraging community education, ensuring transportation or working with facilities to ensure updated skills and quality performance. For the past year, EMAS, led by Jhpiego, has been working in Labuhanbatu and elsewhere across Indonesia as part of a concerted effort alongside the Government of Indonesia to improve maternal and newborn survival. Through community health volunteers (MKIAs) and a group of civil society leaders, EMAS worked with the local government and health office to increase facility-based deliveries. Following collaborative discussions with EMAS, the district health office mandated that all pregnant women should give birth in a health facility—ensuring that mothers like Suriyana receive skilled, quality care during childbirth. Indeed, the Labuhanbatu district health office reports that from 2011–2013, 70 percent of women chose to give birth at home, while in 2014, 90 percent of births in the district took place in health facilities. Village midwives in the region, motivated by the district health office’s mandate, made a commitment to no longer help with home deliveries, ensuring that women give birth at facilities. EMAS also began working side by side with administrators, doctors and midwives in several facilities in the district, including Labuhan Bilik, to improve the quality of care. EMAS put in place a set of standards with which facility staff could assess performance and identify areas for improvement, and mentored facility staff to improve their skills in critical areas, such as managing infection, hemorrhage, pre-eclampsia/eclampsia (high blood pressure during pregnancy), as well as obstructed labor and newborn asphyxia. With a strong focus on preparedness, EMAS introduced health facilities to the concept of conducting emergency drills. Dr. Eka Dewi Mulyati, who works with EMAS and helped mentor the health center, recalled that workers were nervous during Labuhan Bilik’s first asphyxia emergency drill. Soon enough, however, their confidence grew. “We want to achieve a better performance standard—the EMAS standard,” she said proudly. EMAS is working with hundreds of hospitals and health centers like Labuhan Bilik across Indonesia to ensure that they are prepared and capable of providing high-quality care during emergencies. With skilled and trained health workers—who are able to provide quality and timely care during pregnancy, childbirth and the postpartum period—more mothers and babies will survive. UNICEF Statistics and Monitoring Section. Maternal, Newborn & Child Survival: Indonesia. 2012. Retrieved on June 6, 2013, from http://www.childinfo.org.